This is a shed that really does have the wow factor from the very first time you open that good sized door. At 8 X 10 the amount of storage space that you have to make use of is almost daunting. You really can have the shed of your dreams and make sure everything you own has its own special place because of the huge amount of room there is inside. 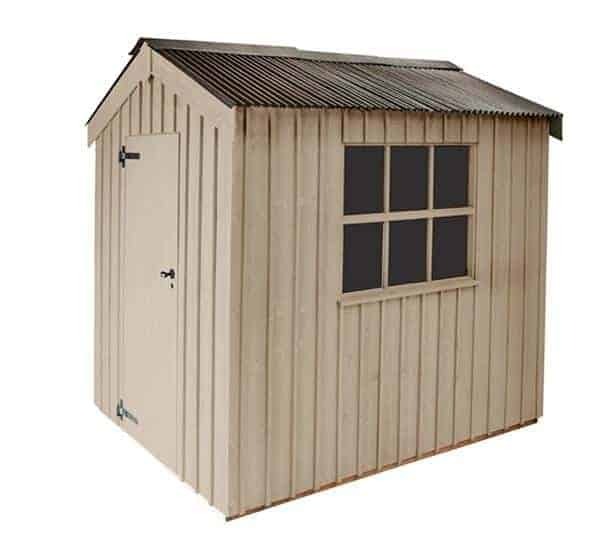 It is not just the epic storage space that makes the Peckover Shed so great, the overall look, design and the first rate materials that were used to build it make this one of the most impressive storage sheds you will ever see. The corrugated apex roof is very eye catching with its classic look and interesting design The roof will keep out the rain and look great doing so. The whole shed has an extra high quality feel to it. 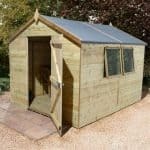 Starting with the sawn cladding walls and working its way all the way down to the Scandinavian Redwood floorboards and floor joists, the Peckover Shed has been created to make sure that it is the only shed that you will ever need in your garden. It also proves that you can have a strong and study shed that is easy on the eyes. This is a very deceptively large shed which is something we really liked from the moment we saw it. The Peckover Shed because of the way that it has been designed and because of the way which it is made to be placed in a garden, does not look all that large from the front. However, the width is 7 feet 8 inches, which is impressive in its own right, but when you open that door and take your first look inside, you see that huge 9 feet 8 inches of space which looks like it goes on forever. We feel that most people could put all their gardening items in here, including the mower and still have room to spare. Along the ridge there is near enough seven feet of headroom to make walking around easy and at the eaves, you have six feet of height which is also a very reasonable amount. Crane were clearly thinking outside the box when they came up with the decision to make use of sawn cladding for the walls. This is classically British right here and it looks wonderful and just has a classy kind of style to it. The cladding, like the roof boards, is made from Scandinavian Redwood and at 12 x 150 mm, and is certainly in it for the long haul. With a very neat looking, 16 x 38 topping, the cladding really does come to life and give a very pleasant overall appearance. But as we all know looking good means nothing if it cannot protect against the elements, and we are very happy to tell you that this style of cladding will just make the rain bounce right off and stay outside. 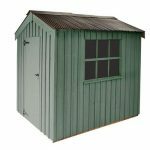 The Peckover Shed is the type of shed that when you touch it, you know right away that it is strong and made with the best materials. What gives it this strong backbone is the frame that is inside. This is where that Scandinavian Redwood really comes into its own and shows just how strong it is. 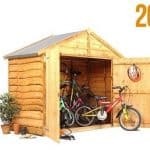 The dimensions of the frame are 38 x 50 mm which is more than enough to ensure the shed stays solid for many years. The frame like everything else here is made to last and we love that! When you buy a shed this large, you clearly have intentions of putting a vast amount of items inside. This requires a strong floor, not just a strong floor, but a floor that is going to last. For this Crane have used the same boarding that is in the roof. These 16 x 125 mm boards feel very nice under your feet and if you are wondering why they are so solid it is because they have a bit of back up in the form of some 19 x 50 mm floor joists which Crane have placed in exactly the right spaces to make sure the weight is evenly distributed through the shed. A shed this fantastic deserves to be treated well and looked after. This starts right away as you will need to give it a generous amount of wood treatment. This will really make sure your shed will last for many years. 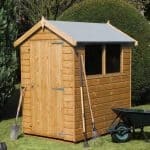 It also will make you get into the habit of looking after your shed right from the get go. Crane give their standard two year warranty with the Peckover Shed. This will cover you against general problems that may occur during the early years of the shed. So with a simple call to Crane, you can arrange for them to come and take care of the repairs. There are a couple of things to know about their warranty. First of all any damage caused by you or anyone else is not covered, and also they will advise you on what is and what is not a suitable area for the shed to be placed. Not taking their advice may result in you not being able to make use of the warranty. This is a very good sized shed so it is only natural you are going to want to put a lot of items inside. To save you having to play Twister trying to get your items inside, Crane have made use of a decent sized door. 1800 mm high and 710 mm wide, we feel is more than enough to be able to get things in and out. Even something like a large lawnmower is not going to be a problem to get it inside. The door hinges are finished in a very sleek looking black, and in addition to looking good they also will keep the door in its place. The other furniture on the door is a nice black handle and lock which really compliment the hinges. There is a window on the side of the shed and it is a very elegant looking, Georgian style window. Give it a little tap and you will see that it is actually made from glass. This was something that was a very nice surprise for us the first time we saw the shed. The glass has been toughened so if you have kids or the grandchildren round for the day then the occasional hit with a ball is not going to be the end of the world. The mortice lock which is on the door offers the perfect amount of security. While some people will like to add their own padlock or some other kind of lock, we feel that the mortice lock which comes with the shed not only fits in with the other door furniture, but is also more than enough to keep everything safe. The design of the shed will most likely mean that the window is not facing the most open area of your garden, but if by chance it is then a curtain or maybe some blinds would offer you some additional privacy. There are six different colours of paint and each one has its own style. For example, Terrace Green gives the shed a very, workshop type of look. Wades Lantern on the other hand will give it a more, friendly and inviting style. Painters Grey, Disraeli Green, Dome Ochre, and Earls Grey are the other options available to you. This is a rare shed that we feel pretty much everyone would universally agree is high quality from top to bottom. Crane have chosen these materials not just because they look good, but also because they know that they will be able to last for many years and take the abuse our British weather will throw at them. The storage size that the Peckover Shed offers is nothing short of amazing. By cleverly adding some shelves to the back or side wall, you can even make it so there is even more space to make use of. 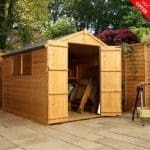 A shed this large would be a huge undertaking for any average DIY enthusiast, but thankfully this is not something you have to worry about as Crane will build the shed for you to make sure that it is done right. A score this high may seem odd for a shed that is over two thousand pounds, but we feel the extra high quality and the phenomenal amount of storage space makes this a shed that is well worth the investment. Final Thoughts: The Peckover Shed is something that we fell in love with as soon as we opened the door and saw that huge space smiling back at us just begging to be filled. We know that many people are going to have a great time making use of all this space and not having to worry about fitting everything in or piling stuff up. The amount of storage available is wonderful, but let’s not overlook just how much of a great looking shed this is. 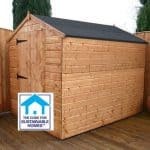 In addition to giving you all that room to store your belongings, you are also getting a shed that will be something you are proud to have as a feature in your garden.